Solana Beaches' two-mile shoreline is more cliffs than beach, but the city has cut access paths into the cliffs for easy access to its water. 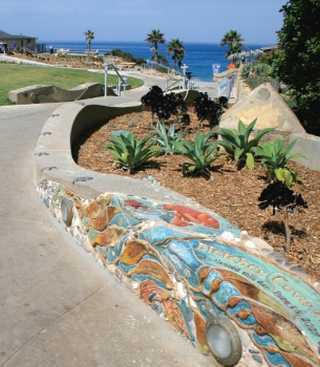 Free public parking is available at each of these city-run beaches, and pathways and small park areas meander along the cliff tops, a perfect setting for a stroll. Photo opportunity: At high tide, be sure to catch the waves pounding against the cliffs almost anywhere along the city's shoreline. Tide Beach Park, the city's most northern beach, is known for its wide, flat reef or "table top" and tide pools at its northern edge. 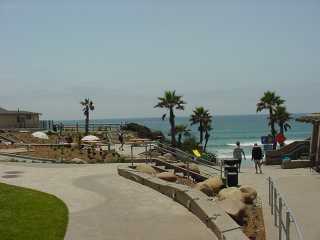 This is a beach for surfing and surf fishing, snorkeling, scuba diving; somewhat less for swimming and body boarding. Fletcher Cove, (shown above and below) a half-mile south of Tide Beach Park, is also called "Pillbox" for its one-time World War II gunnery installation, now long gone. This is the main beach, conveniently just three blocks from the train station. Most of the beach itself is often inaccessible at high tide. But there's plenty else to do: a picnic area, basketball courts, volleyball, shuffleboard and ample parking. When the tide is low enough, Pillbox is popular for surfing and body boarding. It's also home to the town's Marine Safety Department Headquarters, a busy office, since the Junior Lifeguard Program is especially strong here. North Seascape Surf Beach, or "Cherry Cove," just south of Fletcher Cove, has wide, sandy beaches below its cliffs for swimming, surfing, body boarding, snorkeling and just walking along the beach. 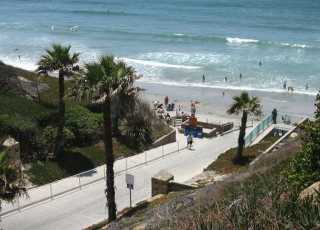 Del Mar Shores Beach is Solana's southernmost beach, known for its scenic viewpoint above the cliffs. It's got three small parking lots, picnic areas, and the beach itself draws surfers, fishermen and snorkelers as well as swimmers and body boarders. The city offers a range of hotels an easy walking distance from the water. Also choose from great nearby restaurants. Be sure to also check out the neighboring city of Del Mar - how many towns can boast of beaches right next to the Del Mar Racetrack and the San Deigo County Fairgrounds. Locals who walk early-morning along the beach there say they frequently see trainers walking their thoroughbreds along the sand! We also think the city has a terrific page for visitors about its beaches. To link to the city's page about it's beaches, click here. Return to the Solana Beaches city page.